Yellow and white have been the papal colors since 1808 when they were first used in a cockade, i.e. a circular cloth badge. The keys of St. Peter, crossed diagonally, have symbolized the papacy's spiritual mission since the middle ages. They are referenced in the New Testament, in the words of Jesus to Simon: “I will give you the keys of the kingdom of heaven. Whatever you bind on earth shall be bound in heaven; and whatever you loose on earth shall be loosed in heaven” (Matthew 16:19). The triple tiara has symbolized papal temporal sovereignty for centuries, as well. The Vatican City flag design is specified in its constitution, with an annex that provides an illustration. The latter has changed only slightly in successive versions of the constitution. It portrays a ceremonial flag with square dimensions, and a special staff, finial, and cravat. This ceremonial flag is carried by the Pontifical Swiss Guard akin to an infantry color. Apart from the ceremonial flag, the constitution does not explicitly specify proportions for state flags displayed on official buildings; and in actual practice at the Vatican, they are currently oblong, in the same proportions as those of Italy’s flag (2:3). However, in decades past, square state flags were often seen. The Vatican flag is flown on occasions specified by the Pontifical Commission for Vatican City State, its legislative body, including papal anniversaries and Roman Catholic religious feast days. It also flies at properties of the Holy See in and near Rome which enjoy extraterritorial immunity according to the Lateran Treaty of 1929 and subsequent agreements. Upon the pope’s death it flies at half-staff, until the completion of the nine-day mourning period that follows his funeral (the novemdiales). It also flies at diplomatic missions of the Holy See, especially its Apostolic Nunciatures (papal embassies). Roman Catholics throughout the world often use the Vatican flag to express Catholic identity at churches, educational institutions, and other establishments. The current papal flag originated in the Papal States, where it was introduced for merchant and fishing vessels on September 17, 1825. It was used until the Papal States disappeared in 1870, but not on land; and it was not the only papal flag. Other flag designs were used by Papal States militias, forts, armed vessels, or by the general public. Many of these flags are preserved in museum deposits or are attested in contemporary art. 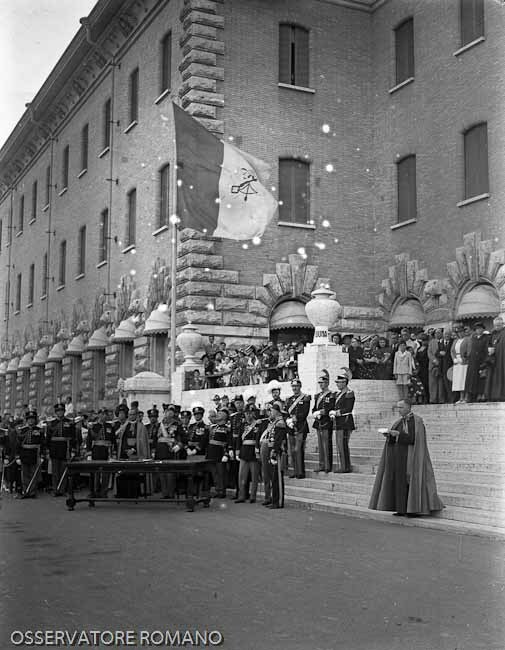 Authorized papal flags often changed with each new pope. Until the seventeenth century, they often had red fields bearing papal emblems. From the seventeenth through the nineteenth centuries, they usually had white fields (like the French royal standard) charged with various papal symbols. In the 1800s, yellow-and-white flags began to appear, and grew in frequency. These colors were based on a yellow-and-white papal cockade first introduced by Pius VII on 13 March 1808 for papal troops and diplomats who remained loyal to the pope and who opposed the occupation of the Papal States by Napoleon. He abolished it and exiled the pope; but it was resurrected after Napoleon’s downfall and the restoration of the Papal States in 1814-1815. In 1825, the first yellow-and-white flags were introduced for various maritime purposes, but the navy retained its old white designs. On land assorted yellow-white flags were soon employed by the Civic Guard (1831-1848) and the papal infantry (ca. 1831-1870). By mid-century various yellow-white flags were used by private citizens, some state fortresses (from at least 1849), and the Palatine Guard (from 1859). Their designs changed periodically and usually bore various papal emblems, but the final papal infantry color was a plain yellow-white flag with no emblem (1862-1870). The same flag design – a plain yellow-white vertical bicolor – flew from Castel Sant’Angelo, the major papal fortress in Rome, upon its seizure by Italian forces in September 1870. It is preserved by the Vatican Historical Museum. A similar flag, but with the tiara-keys emblem bisecting the stripes, flew in 1870 at Rome’s Porta Pia fortifications, and is also held by the Vatican. The latter two designs seem to have remained in use by various papal loyalists during the Roman Question period (1870-1929) which followed the fall of Rome until the creation of Vatican City. The one with the emblem served as the proto-national papal flag at the Vatican and related offices. 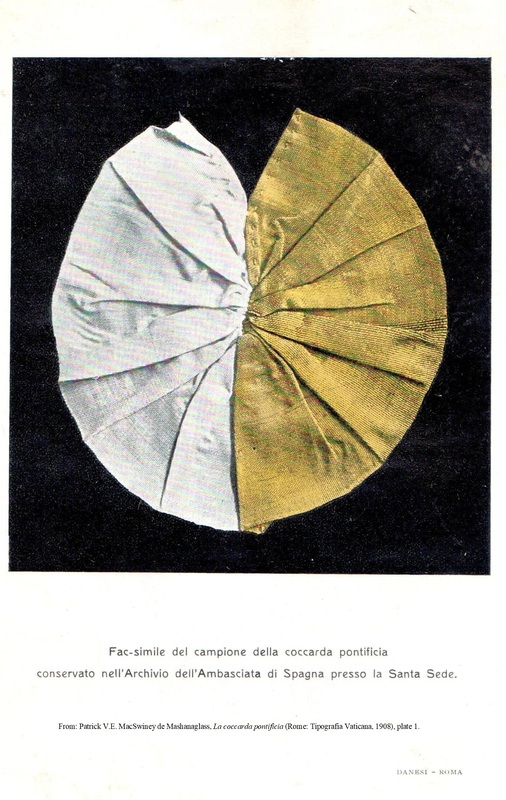 The yellow-white papal cockade of 1808 was probably based on the traditional colors of the keys of St. Peter, gold and silver. In heraldry these colors translate as yellow and white, especially when rendered in cloth. As early as the middle ages, Dante Alighieri describes the keys of the kingdom as gold and silver, or as yellow and white. The previous Roman cockade, adopted in 1800, was red and yellow. This, too, may have been a reflection of the Petrine keys, since medieval papal banners were often red with the crossed keys in gold. The modern civic flag of Rome is also red and yellow; or more specifically, a vertical bicolor of maroon and golden-yellow. However, this flag was not used in the Papal States. When placed on a red shield, the tiara-keys emblem forms the coat-of-arms of Vatican City State; but when the emblem appears alone, it more properly represents the Holy See. The Vatican website shows both of these insignia with the gold key-handle on the heraldic dexter (i.e., the observer’s left). However, the juxtaposition of the keys is reversed in the personal coat-of-arms of the pontiff. For several centuries, popes have used the tiara-keys emblem as heraldic “supporters” for their own personal armorial shield. However, the last pope to wear an actual tiara was Paul VI, and recent popes have replaced it with a miter in their pontifical arms. The flag of the Pontifical Corps of the Swiss Guard is displayed on special occasions, including the swearing-in of new recruits. Its basic pattern was approved by the Secretariat of State on November 1, 1913, and bears features drawn from previous Guard flags. It is square with a large white cross reminiscent of Swiss military flags in centuries past. At the center appears the commander’s coat-of-arms within a floral wreath. Two of the flag’s resulting quarters bear the current papal arms juxtaposed with those of the Guards’ founder, Pope Julius II, against a red background. The remaining quarters bear stripes in the Guards’ colors, blue-red-gold. These recall the armorial colors of Pope Clement VII de’Medici, rescued by the Guard at great sacrifice during the sack of Rome in 1527. For details, see William Becker, Vatican Flags: Keys & Crowns since 1800 (Boston: North American Vexillological Association, 2018). Click to order the book, review the Table of Contents, or view a summary chart of Papal Flags in the 1800s. Donald Lindsay Galbreath, Papal Heraldry (London: Heraldry Today, 1972, edited by Geoffrey Briggs), p. 17-26. "Legge Fondamentale dello Stato della Citta del Vaticano," Acta Apostolicae Sedis (supplement for the Vatican City State, 8 June 1929), article 19 and Annex A. Updated version in Acta Apostolicae Sedis (supplement for the Vatican City State, 26 November 2000), article 20 and Annex A. See William Becker, Vatican Flags: Keys & Crowns since 1800, pp. 97-100. William Becker, Vatican Flags: Keys & Crowns since 1800, pp. 102-106. William Becker, "The Vatican Flag: Proportions & Alternatives," NAVA News, no. 213 (Jan–Mar 2012, Trenton NJ: North American Vexillological Association), pp. 2-4. 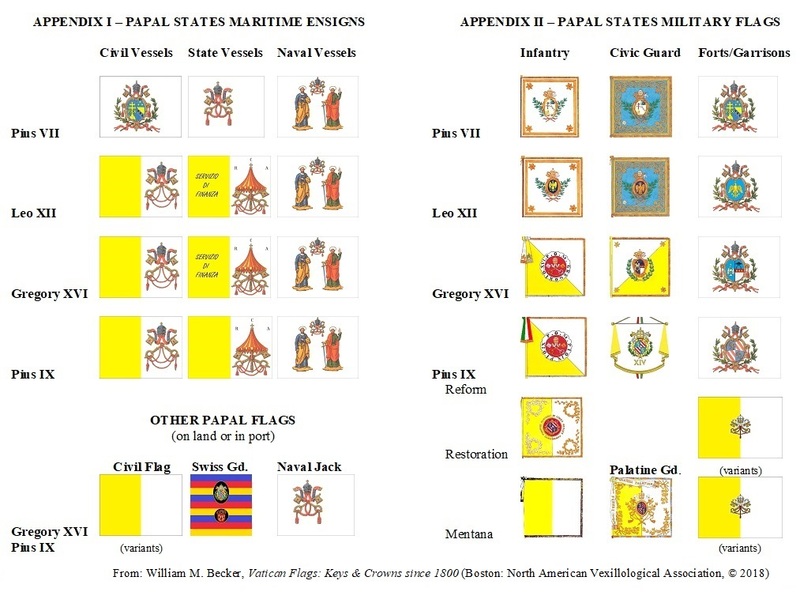 William Becker, Vatican Flags: Keys & Crowns since 1800, pp. 106-109. Bandiere di segnale delle Marine dei vari Stati, undated 19th-century manuscript. Rome, Biblioteca Casanatense, MS 3800 (CD-Rom CSMIN 144). See William Becker, Vatican Flags: Keys & Crowns since 1800, pp. 35-39. William Becker, Vatican Flags: Keys & Crowns since 1800, pp. 9-75. Aldo Ziggioto, "Le bandiere degli stati italiani (Parte I)," Armi Antiche (Torino: Accademia di S. Marciano, 1981), p. 91-124. Patrick V.E. MacSwiney de Mashanaglass, La coccarda pontificia (Rome: Tipografia Vaticana, 1908). 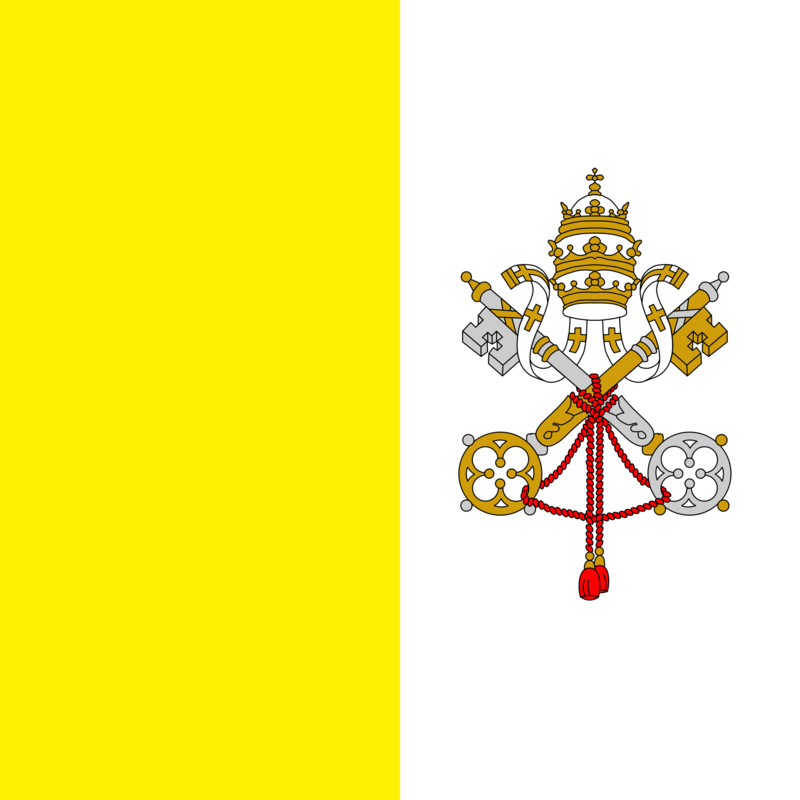 Claudio Ceresa, “Il giallo e il bianco, da due secoli colori pontifici,” L’Osservatore Romano (Vatican City), 8-9 July 2008; translated as “Vatican City State Flag Flies for Two Centuries [sic],” L’Osservatore Romano weekly edition in English, 6 August 2008, p. 12. See William Becker, Vatican Flags: Keys & Crowns since 1800, pp. 21-27. William Becker, Vatican Flags: Keys & Crowns since 1800 (Boston: North American Vexillological Association, 2018), pp. 35-75. L. Piroli, Costumi militari dello Stato Pontificio 1823-1870 [also known as “Piroli Collection,” “Raccolta Piroli”], Museo Centrale del Risorgimento di Roma, Library, mss. 71-79, information courtesy of “Internet Culturale.” Attilio Vigevano, La fine dell'esercito pontificio (Rome: Stabilimento Poligrafico per l'Amministrazione della Guerra, 1920), p. 72-77. Stefano Ales, Insegne militari preunitarie italiane (Rome: Ufficio Storico dello Stato Maggiore dell’Esercito, 2001), p. 87-91, 382-397. Museo Vaticano Storico, Palazzo Lateranense, inventory no. 30615: 250 x 270 cm (98.4 x 106.3”). See William Becker, Vatican Flags: Keys & Crowns since 1800, pp. 51-59. 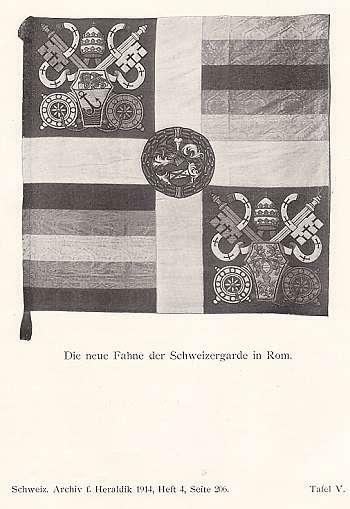 William Becker, Vatican Flags: Keys & Crowns since 1800, pp. 51-59. Conti Paolo & Roncone Fabrizio, “Veglie divise, ultima sfida su Pio 9°,” Corriere della Sera, 3 September 2000, p. 9. William Becker, Vatican Flags: Keys & Crowns since 1800, pp. 89-93. William Becker, “The Proto-National Papal Flag,” The Flag Bulletin, Vol. 45:2 (Winchester, Mass. : Flag Research Center, March-April 2006), p. 42-53, plus front & back cover illustrations. Ben Zaricor, Zaricor Flag Collection, Santa Cruz, CA, inventory no. 222. William E. Barrett. Shepherd of Mankind: A Biography of Pope Paul VI (Garden City: Doubleday, 1964), p. 96b. Attilio Vigevano, La fine dell'esercito pontificio (Rome: Stabilimento Poligrafico per l'Amministrazione della Guerra, 1920), p. 69-70. Holy See Press Office, “Coat of Arms of the Holy See and of the State of Vatican City.” See William Becker, Vatican Flags: Keys & Crowns since 1800, pp. 110-113. The flag measures 220 c.m. (86.6”) square. For the current version, see “The Flag” (official Swiss Guard website). Cf. Robert Walpen, La Guardia Svizzera Pontificia. Acriter et fideliter. Coraggio e fedeltà, Second Edition, Locarno, Switzerland: Armando Dadò, 2005, p. 110-114, including the original 1911 sketch. “Die neue Fahne der Schweizergarde,” Archives Héraldiques Suisses / Schweizerisches Archiv für Heraldik, vol. 28, no. 4 (Zürich: Imprimérie Schulthess & Co., 1914), p. 205-206 & Plate 5. See William Becker, Vatican Flags: Keys & Crowns since 1800, pp. 115-119. • Fig. A – "Legge Fondamentale dello Stato della Citta del Vaticano," Acta Apostolicae Sedis (supplement for Vatican City State, 26 November 2000), Annex A. • Fig. B-D – Author’s archives, contemporary photos. The Vatican ceremonial flag (Fig. 2) measures 116 cm (45.7”) square. • Fig. E – From an undated supplement to Pavillons des puissances maritimes en 1819 (Paris, 1819), pl. 8 annex. Based on “Bandiera per i legni da commercio e da pesca,” Bandiere di segnale delle Marine dei vari Stati, undated 19th-century manuscript, Rome, Biblioteca Casanatense, MS 3800 CSJ6022. • Fig. G – A. & B. Bruckner, Schweizer Fahnenbuch (St. Gallen: Zollikofer, 1942), plate 70. Flag held by the Rathaus in Stans, Switzerland: 117 x 126 cm (46 x 49”). • Fig. H – Paolo Edoardo Fiora, Bandiere in Piemonte (Turin: Accademia di S. Marciano, 1971), fig. 77. 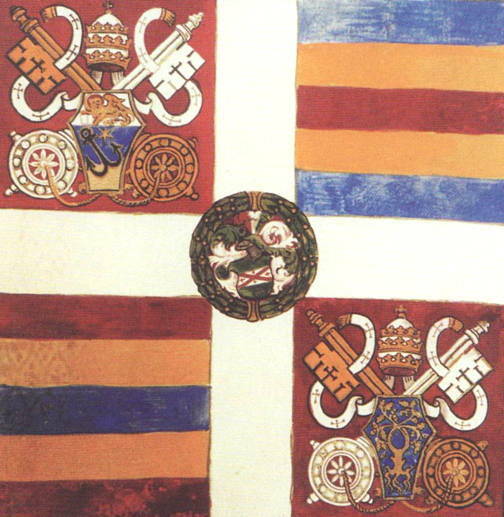 Flag held by L’Armeria Reale di Torino, no. O-23: 140 x 140 cm (55 x 55”). • Fig. I – Author’s archives, personal photo. 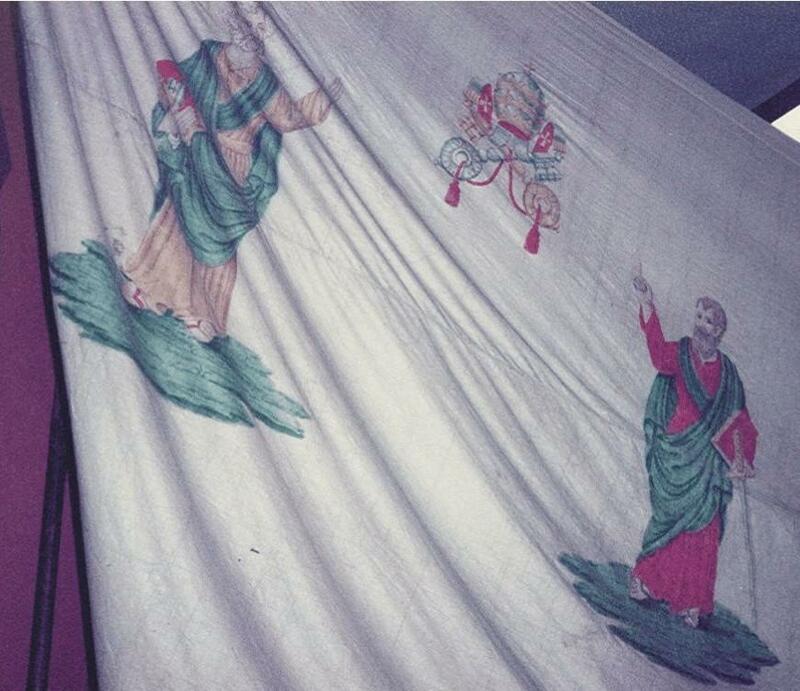 Flag held by the Museo Storico Vaticano, no. 30516: 150 x 160 cm (59 x 63”). • Fig. J – Colonel Attilio Vigevano, La fine dell'esercito pontificio (Rome: Stabilimento Poligrafico per l'Amministrazione della Guerra, 1920), plate 1. 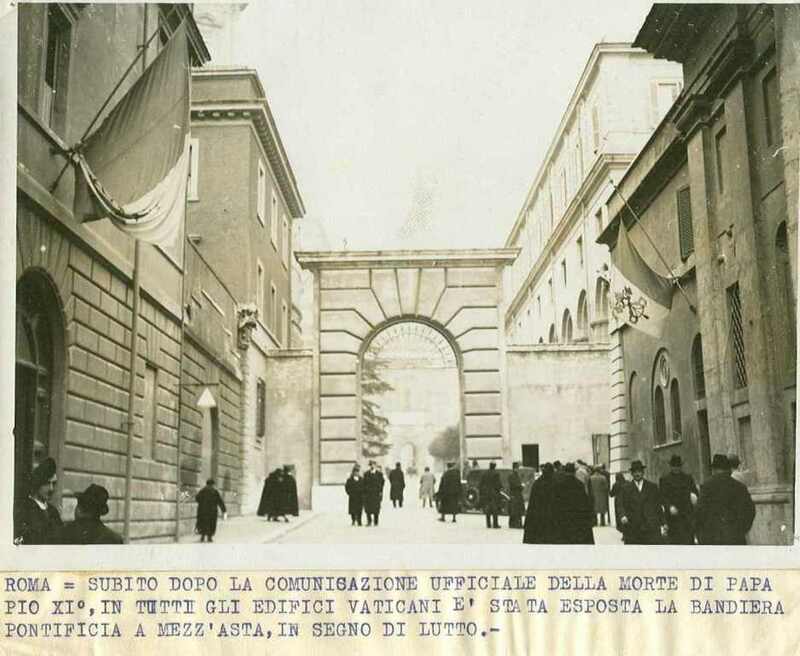 Online access via Museo Centrale del Risorgimento, Rome. • Fig. K – Vatican Gendarmerie Collections: 78 x 108" (196 x 274 cm). Photo courtesy of Prince Sforza Ruspoli. Cf. William Becker, “The Proto-National Papal Flag,” The Flag Bulletin, Vol. 45:2 (Winchester, Mass. : Flag Research Center, March-April 2006), p. 43-44 & Figs. 1 & 2. • Fig. L – Author’s collections: 56 x 55” (142 x 140 cm). Cf. William Becker, “The Proto-National Papal Flag,” The Flag Bulletin, Vol. 45:2 (Winchester, Mass. : Flag Research Center, March-April 2006), p. 44-45 & front cover illustration. Vatican flag graphic, 2000 version; and its use at the Apostolic Palace, Residenza Paulo VI, and as a ceremonial color.